Together, the American Indian Science & Engineering Society (AISES), the National Society of Black Engineers (NSBE), the Society of Hispanic Professional Engineers (SHPE) and the Society of Women Engineers (SWE), the preeminent diversity engineering organizations (collectively serving more than 85,000 pre-collegiate, collegiate and professional members), have formed a coalition focused on a bold national goal: to produce 50,000 diverse engineering graduates annually by 2025. Our expertise and more than 188 years of collective experience perfectly position us to tackle this goal. Moreover, through our partnership with the American Association of Engineering Societies (AAES), we will broaden our reach across the entire engineering community. The executive leadership teams of the National Society of Black Engineers (NSBE), the Society of Hispanic Professional Engineers (SHPE) and the Society of Women Engineers (SWE) met at SWE Headquarters in Chicago, Ill., to discuss the national landscape of Black, Hispanic and female engineering baccalaureate degree recipients. Specifically, the leadership teams discussed what their organizations could do collectively to increase their constituents’ representation in our nation’s rapidly evolving population of engineering undergraduates. From the in-depth discussions of these professional societies, surrounding the persistence and degree attainment rates of their memberships and U.S. engineering students as a whole, arose the establishment of a challenging goal: to graduate a total of 50,000 female engineers, Hispanic engineers and Black engineers annually by the year 2025. To ensure that the sustained leadership needed to achieve this goal was in place, the Executive Director of NSBE and the CEOs of SHPE and SWE committed to forming The 50K Coalition Leadership Circle. The 50K Coalition is the umbrella organization they created to meet the goal. NSBE, on behalf of The 50K Coalition Leadership Circle, submitted a grant proposal to the United Engineering Foundation (UEF) to support a convening of our nation’s engineering community. The purpose of the convening would be to create a mutually agreed upon framework and action plan to guide the group’s collaboration and provide benchmarks for success. The United Engineering Foundation (UEF) committed to funding the historic convening, citing the meeting’s interdisciplinary nature and its alignment with the engineering Founder Societies’ vision "to advance the engineering arts and sciences for the welfare of humanity" and their mission "to support engineering and education by, among other means, making grants." The American Indian Science and Engineering Society (AISES) joined The 50K Coalition Leadership Circle. 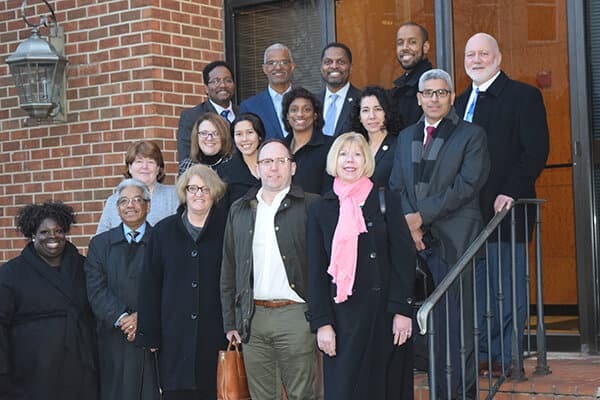 Led by experts in coalition building, The 50K Coalition Leadership Circle convened a cross section of our nation’s foremost thought leaders committed to addressing underrepresentation in the U.S. engineering workforce. These engineering deans, engineering professional society leaders, researchers, advocacy groups, corporate leaders and government agency leaders began drafting a comprehensive framework that the engineering community will use to increase inclusion in engineering in our nation’s academic institutions and its workplaces. In April 2016, the leaders of AISES, NSBE, SHPE and SWE (The 50K Coalition Leadership Circle), through the support of the United Engineering Foundation (UEF), hosted a two-day planning meeting in Washington, D.C. with representatives of the host organizations and more than 80 other leaders, to develop a comprehensive plan to increase diversity throughout engineering and produce 50,000 underrepresented minority and women engineering graduates annually by 2025. The host organizations (AISES, NSBE, SHPE and SWE) along with the other participants, including deans of engineering schools and representatives of other engineering societies and engineering advocacy groups, began drafting a strategic plan, including evaluations and measurable outcomes, that will increase the number of African-American, Latino and women engineering graduates. Led by experts in coalition-building, the convening included panel discussions, breakout sessions and one-on-one engagement. The participants drafted a strategically effective plan to combat the challenges to inclusion in engineering, in academia and the workplace, and signed the pledge necessary to realize our 50K goal. In addition, the agenda outlined the fundamental need to craft and present white papers highlighting best practices in K–collegiate engineering education, diversity programs and the workplace. An all-inclusive tracking system will be developed to capture data about the Coalition’s work toward the 50K goal, and semi-annual meetings as an outcome of the comprehensive plan will take place to examine all newly acquired data. Currently, The 50K Leadership Circle is actively working with Coalition members to refine their individual Action Plans towards achieving the 50K goal and has engaged several entities interested in funding the various aspects of the Coalition backbone organization moving forward.